So this substitute beer is a ‘Cereal Medley’ of Barley, Rye, Wheat, and Oats…. Full of complexishness from the 4 grains, and weighing in at 7.85% abv, Then joyously dry-hopped for that big aroma and resinous hop flavor. Picked-up a single bottle at Kappy's in Norwell as part of a mixed six-pack for about eleven dollars. No discernible bottled-on date. Have had many brews from these guys before. Solid brew. From notes 3/31/13: Pours a clear pale amber producing 3 fingers of billowy, foamy, off-whit, nicely lasting head that leaves nice rings and webs of lace. Aroma is bitter grapefruit heaven, light pine resin, rye spice, caramel, and tropical fruits with some lemon. Taste is similar with the caramel more distinct but wrapped in fruit layers of orange, pineapple and grapefruit backed up by hop and rye spice and a hint of pepper in the finish. Very Lagunitas style hoppiness. The hops have a fresh or "green" taste. There is a nicely lasting fruity but bitter aftertaste. Mouthfeel is a little heavy, slightly oily and slick it is also slightly creamy and very smooth. Very, very pleasant. I need more of this. This, feels like a good mixture of Sumpin' Ale + Brown Shugga. It has the sweetness of Brown Shugga alright, but it also has that rich smell of citrusness coming from the likes of Sumpin' Ale. For me it would be Sumpin Ale > This > Brown Shugga, but only by really close (0.1 point difference) range. 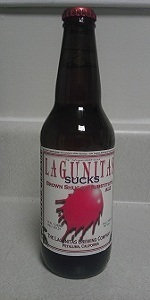 Overall a great beer, didn't know Lagunitas was this great.